The day before Game Six of the 1931 World Series, more than 500 baseball fans crowded into the Union Station Midway to wait for the St. Louis Cardinals’ special train to arrive.1 The gathering was celebratory in manner as their team returned home sporting a three-games-to-two advantage over the favored Philadelphia Athletics. Gabby Street altered his lineup before Game Five by shifting Martin to cleanup with the struggling Bottomley batting sixth, and his decision produced positive results as the two men combined for five hits. Street conveyed confidence, “If we’d had any luck in the first game, the series would be over right now. But what’s the difference, it’s taking just a little longer.”12 Connie Mack was concerned about his Philadelphia team on both sides of the baseball. He was worried about the inability of his players to hit consistently against the Cardinals’ hurlers, and the inability of his pitchers to stop the hitting of Martin.13 After five games, the A’s were batting just .217 to the .257 mark posted by the Redbirds. It all fell apart for Derringer in a flash. On a Jimmie Foxx grounder to open the fifth, Flowers’ throw pulled Bottomley off first for an error. A bunt sent Foxx to second base before Jimmy Dykes drew a walk. Foxx broke in the “new” home plate when he scored on a single to center by Dib Williams. After Grove fanned, Derringer became too careful with the top of the A’s order and then lost his composure. Bishop walked, and another free pass on a disputed full-count pitch to Mule Haas forced Dykes home. Mickey Cochrane’s hard grounder went off the glove of second baseman Frankie Frisch for another tally. Derringer’s stint ended after he walked Al Simmons to plate the fourth run. Syl Johnson relieved a seething Derringer, and retired the 10th batter of the inning, Foxx, on a pop fly to shortstop.19 All of the runs were unearned, but it was little solace with the score now reading Philadelphia 4, St. Louis 0. Grove permitted a single to Hafey to open the Redbirds’ fifth, but then retired the next three batters. The Cardinals finally tallied in the sixth when Flowers, who had doubled, scored after Frisch lined a two-out single past Foxx into right field.20 Martin, looking to extend the inning, popped out to second baseman Bishop in short right. 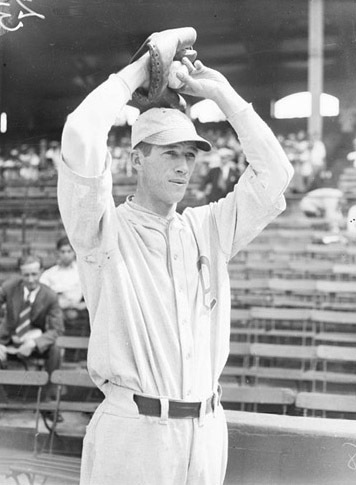 In the seventh, Street went with right-hander Jim Lindsey, who had been effective in Game Four. But on this afternoon Lindsey gave up four runs (two earned) on three singles, a hit batsman, another bases-loaded walk, and a dropped fly ball by Hafey, which concluded the carnage, let in two runs and yielded an 8-1 Philadelphia advantage. The Cardinals’ faithful saw little that mattered during the final three innings. Cochrane was charged with the first Philadelphia error of the series when he mishandled a third strike and allowed a batter to reach first to start the ninth. One out later, Martin walked. But Grove worked out of the jam and earned his second complete-game win in the series with a sparkling five-hit, seven-strikeout performance that took one hour and 57 minutes. The pair of fielding miscues by Flowers and Hafey factored in six of the Athletics’ eight runs. 1 “Street Names Paul Derringer To Pitch Tomorrow,” St. Louis Post-Dispatch, October 8, 1931: 1B. 2 Walter W. Smith, “Pepper’s’ Big Show Arrives Here,” St. Louis Star-Times, October 8, 1931: 19. 4 ‘Photo Caption’, St. Louis Star-Times, October 8, 1931: 19. 6 “Street Names Paul Derringer To Pitch Tomorrow”: 3B. 7 Stan Baumgartner, “Through The Series Sieve As Connie Cut The Cards,” Philadelphia Inquirer, October 10, 1931: 16. 8 “Gossip of Sixth Game,” The Sporting News, October 15, 1931: 6. 9 Author’s Note-The report by E. T. Bales proved untrue as Bottomley remained with the Cardinals for the 1932 season. He was subsequently traded to the Cincinnati Reds on December 17, 1932. 10 “Reported Sale of Bottomley Denied by Branch Rickey,” St. Louis Star-Times, October 8, 1931: 19. 11 ‘United Press’, “Bottomley Sold, Report,” Pittsburgh Press, October 8, 1931: 29. 12 “Worried,” The Pittsburgh Press, October 8, 1931: 29. 13 “Happy,” The Pittsburgh Press, October 8, 1931: 29. 14 Herman Wecke, “Earnshaw Likely to be Mack’s Pitcher; High to Play Third,” St. Louis Post-Dispatch, October 8, 1931: 1B. 16 Wecke, “Grimes and Earnshaw to Pitch Tomorrow; Mound Duel Likely,” St. Louis Post-Dispatch, October 9, 1931: 1C-2C. 18 “Introducing The World Series Hero,” Pittsburgh Press, October 8, 1931: 29. 19 J. Roy Stockton, “Cards Lose 8-1; Deciding Game Tomorrow,” St. Louis Post-Dispatch, October 9, 1931: 1C. 22 Baumgartner, “Derringer Bitter At Umpire Nallin,” Philadelphia Inquirer, October 10, 1931: 16. 23 Pepper Martin, “‘Think I’ll Do It,’ Martin Confides As He Visions Victory,” Philadelphia Inquirer, October 10, 1931: 1.